So, this thread will make it easy for people looking for others who ask if someone took their picture and want to link to their portfolios so others can find them easily. If anyone took any photos of me, would you be willing to share? I was the female version of The Riddler Friday and Saturday and Sunday I was an Ewok. I had a group with me this year, if anyone has pics, lemme know. I'll be going through mine soon here so I'll look out for you as well. Thank you all. Hay all. If anyone has pictures of me they'd like to share, that'd be awesome. I have a bad habit of not remembering to track them down. I was Koenma on Saturday and Movie Ver. Anthy on Sunday. I did my best to get everyone's name/twitter/instagram/etc., but that can get a bit tricky in such a busy place. So, if you see anyone no tagged here that you know, please tag them, or send me their info. I'd really appreciate it. Also good to note I've only uploaded a fraction of the pictures I took. I've uploaded about 37 out of a good 150 or so I plan to upload. Hoping to have everything uploaded within the next week. Hi! I didn't take photos myself but I was out and about quite a lot, and would be SUPER excited if anybody had pictures of me or my gf! Thursday: I was Wendy Corduroy (Gravity Falls), and she wasn't in cosplay, but I don't know that anybody photographed us. Friday: I was Komaeda Nagito (Super Dangan Ronpa 2), and she was Agnes Oblige (Bravely Default). Sunday: I was Peridot again (with my wig working much better) and she was Jasper. I will slowly upload my selfies on instagram @norcalanimeselfies. I have a few pictures from the Disney and Fate gatherings myself but I have to wait for my boyfriend to upload them. 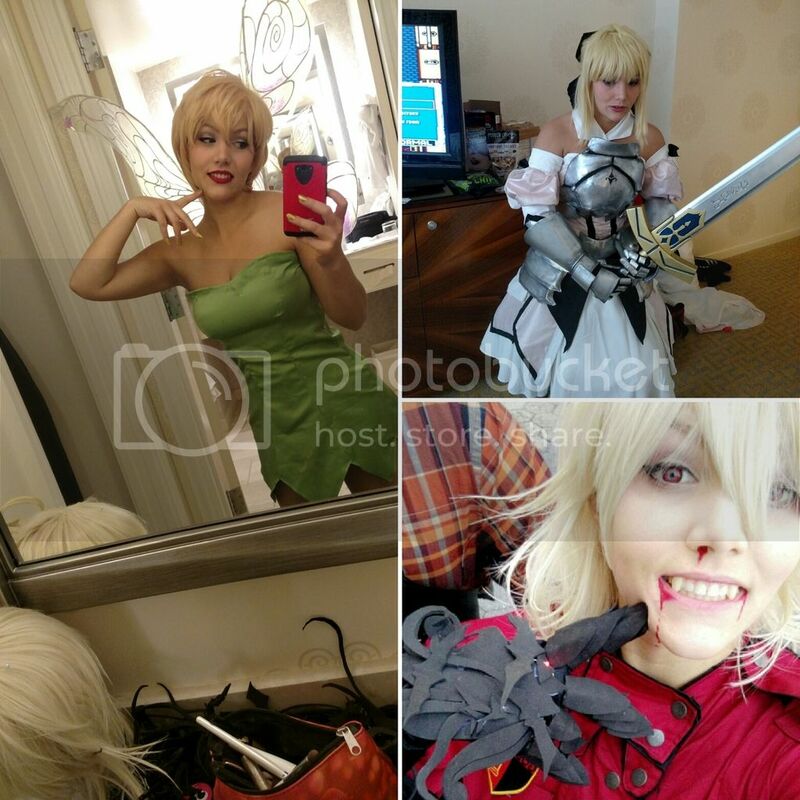 Saber Lily Saturday, and then Tink again since my armor was malfunctioning. And Sunday I was vampire Seras Victoria from Hellsing only until 3pm. Took a bunch of random shots...and a bunch from the FMA gathering as well as the Doctor Who gathering: http://s45.photobucket.com/user/rawien_8706/library/2016%20Fanime?sort=2&page=1 -- Feel free to snag whichever ones you're in! If anyone took any pictures of me (I was the Sans who was in a wheelchair or on a cane 99% of the con this year) I would much appreciate being shown! My own camera is broken so I didn't get any good photos myself so hopefully someone else took a few!! Heyyyyyo! Hoping i can find anyone who took my photo! I was blade and soul, rory mercury lingere and kimono, condy from homestuck and kuroo. Hey I'm wondering if anyone has pictures of me and a friend. Here's all of my pics, feel free to tag yourself. I'm the blue haired keyblade wielder in most of them. Here are mine, feel free to tag yourselves. I was Jemma Simmons on Friday and Astrid (HTTYD2) on Saturday. If you happened to take my pic, could you link me? Hey guys! I want any photos of me! Monday and Sunday at the Hetalia meetup I was spain, I had the spanish flag, and at the meetup you might remember me as the one who gave Romano a yellow rose. Monday I was Daenerys from Game of thrones, I had the egg basket. I wish I knew how to attach my photos, but you can find my cosplay photos on Instagram at Lovely_Lupin to see which ones I was. I was Metal Bat from One Punch Man. Specifically the bloodied, battered one with the ripped off sleeve. I'd love to see some pictures if you guys have them! Another year that I had too much fun and didn't get a chance to take any good photos besides goofy selfies. I wore Jack Spicer on Friday, and Nico Yazawa and Johnny Joestar on Sunday. Here's my Instagram for reference pictures (My boyfriend wore McCree on Friday and Funny Valentine on Sunday, if you have any of those as well! ).